To say my daughter Abbey is a reluctant reader would be a major understatement. She didn't start reading fluently until she was seven years old, which wasn’t a big deal, but finding a book series on which she could get focused and interested was tough. Thankfully, we were blessed to discover Susan K. Marlow's Circle C Beginnings series, and the delightful Andi (short for "Andrea") Carter and the cast of characters in each story. Abbey fell in love with reading!! We are huge Susan K. Marlow fans in this household! Abbey has now read every book in both the Circle C Beginnings and the subsequent Circle C Adventures series. When we heard Kregel Publications was publishing a new series of Susan K. Marlow books about Andrea Carter called Circle C Milestones, my child was sincerely thrilled to be chosen to review the first offering of the new series, Thick as Thieves. You can read that review here. When Abbey realized we’d get to review the second installment Heartbreak Trail, she was once again eager to see it arrive. She watched the mail like a hawk and quickly ran off to start reading it. We are homeschoolers, so once it arrived, I loved allowing this to count as her literature credits for the next few weeks. 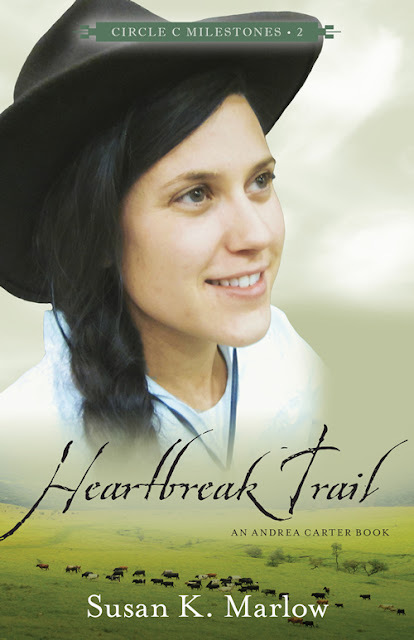 Heartbreak Trail by Susan K. Marlow takes place in 1880s California. Andrea Carter, her mother, and Andi's older siblings help run Circle C Ranch. In this new installment, 15-year old Andi gets permission from her mom to accompany her older brothers on a tough cattle drive. Andi quickly learns how tough and dangerous this adventure can actually be. Having to deal with a pesky cowhand, Andi is forced to rely on God and her brothers even more. Threaded throughout the novel is the sense of family and trust. As a parent, I just love this theme. Abbey's words: I feel as if I have grown up with Andrea Carter. She is my favorite character in each book. In Heartbreak Trail, I loved how exciting the story got once the cattle drive members crossed the river. After I finished each chapter I couldn't wait to start the next, and I really can't wait for the next book! Susan K. Marlow weaves a ton of wholesome mystery, suspense, humor, and adventure into each chapter, holding the reader captive. Best of all, the FREE study guide for Heartbreak Trail, also written by Susan K. Marlow, has been an absolutely wonderful way to review the material, learn vocabulary, study history, learn more about horses, do math, engage in critical thinking, and more! Parents, I wholeheartedly recommend this and any of Mrs. Marlow's books for your child. BOTH boys and girls will enjoy it, because there is plenty of action for both. Heartbreak Trail is recommended for ages 12 and up, but younger, advanced readers can enjoy this as well, or it can work well as a family read-aloud. Heartbreak Trail, in softcover format, retails for $9.99 + $2.50 s/h and can be autographed by Susan K. Marlow herself. We had the entire set of the Circle C Adventures (the previous series) autographed and personalized to Abbey, and recently had some personalized for Abbey's friends as a birthday present. They were thrilled! Click HERE for that option, or you can purchase from Kregel Publications, CBD, or Amazon. FCC Disclaimer: Kregel Publications provided me with a free copy of Heartbreak Trail in exchange for my honest and thorough review. They did not tell me what to say or how to say it. No other compensation was given.